Française, Paris, 1882 (Garland reprint, New York, 1979, vol. 2, p. 722). 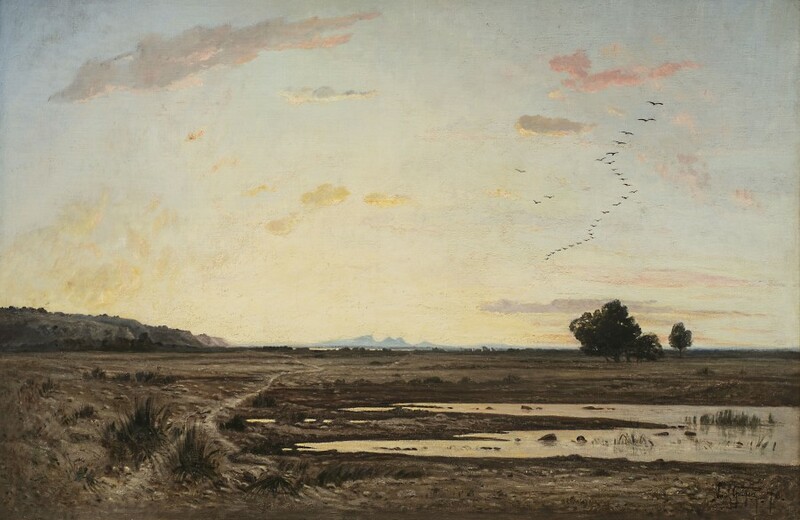 Pierre Miquel, Le Paysage français au XIXe siècle 1840-1900: L’École de la nature, Maurs-La-Jolie, 1985, vol. IV, p. 288. Sylvie Lamort de Gail, Paul Guigou: Catalogue Raisonné , vol. I, Montrouge, 1989, pp. 35 and 153. Claude-Jeanne Bonnici, Paul Guigou: 1834-1871 , Aix-en-Provence, 1989, p. 197, no. 277.
accepted for the annual Salon, where he would continue to exhibit for the remainder of his career. met in Paris at the café Guerbois aux Batignolles, but he chose to pursue his own individual path. location that later another fellow Provençal painter, Paul Cézanne, would immortalize. years (figs. 11-15),4 of which this is the grandest. sunset is reflected in the water, and the whole is infused with a silent, uplifting freshness of vision. of Art, Washington, D.C., the Hood Museum, and three at the Norton Simon Museum in Pasadena.